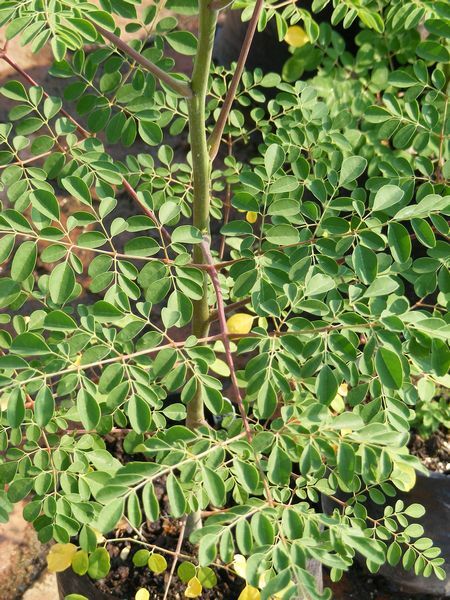 Moringa oleifera is a deciduous fast-growing, drought-resistant tree that can grow up to 10m. Can be cut back annually to 1-2 meters and allowed to re-grow so the pods and leaves remain within arm's reach. It needs full sun and is frost tender. The immature seed pods can be eaten raw/ prepared by parboiling, and cooked in a curry with coconut, poppy seeds and mustard until soft/ or prepared like green peas or green beans. The seeds can be removed from more mature pods and eaten like peas or roasted like nuts. The mature pods can be fried and have a peanut-like flavor. The leaves are eaten fresh as greens in salads/cooked and used like spinach/added to vegetable curries/ as pickles and for seasoning. Young leaves can be fried with shrimp or dried tuna chips, onions and dried chili and eaten along with rice and curry/ or added as a topping to fish soup. The leaves, bark, roots, flowers, fruits, seeds, oil and gum. In developing countries, it has potential to improve nutrition, boost food security, foster rural development, and support sustainable land care. The leaves contains over 92 different vitamins and minerals and 46 types of antioxidants. The pods contains all the essential amino acids along with many vitamins and other nutrients. The flowers are rich in potassium and calcium. Can safely be consumed by small children and adults. Moringa Oleifera lowers blood pressure, improves mood, improves digestion, improves immune system function, protects the stomach lining, treats stomach ulcers and boosts energy levels. It also helps insufficient lactation, tuberculosis, septicaemia, enlarged spleen and liver, bladder and kidney stones and inflammatory conditions. 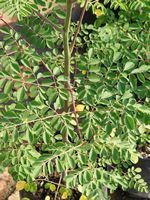 Moringa oleifera may be used as forage for livestock, a micronutrient liquid, a natural anthelmintic and possible adjuvant. Moringa has potential for water purification. In preliminary research, moringa seed powder is being assessed for its potential to make river water potable. Research has showed that filtering with seed powder may diminish water pollution and bacterial counts. Moringa seed oil also has potential for use as a biofuel.